Conventional Precipitation Solids Separation is useful for separating metal pollutants and solids. In this gravity based process the solids are separated out by precipitation with flow rates up to 1,000 gallons per minute. 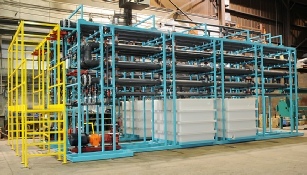 The solids are typically dewatered in a filter press. Nano and RO membrane filtration are used to separate molecules 10 to 1,000 times smaller than those typically removed by more conventional methods. We generally use these technologies when reuse is a priority. Recovery is typically 50 to 75%.